A significant queue of quiffs, flowery shirts and denim dressed hipsters filled The Village on Saturday night. A few receding hairlines with dodgy ponytails and vintage leather jackets seeking nostalgia in the utmost musical reverence of Morrissey and The Smiths tribute band, These Charming Men. 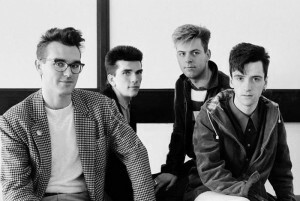 Highly acclaimed, These Charming Men have been charming Smiths fans since 1995. They’ve played at the Smiths & Morrissey convention in LA since 2001 and have worn the crown for the man himself, when they stepped in to replace him at the Fuju Rock Festival in Japan in 2004.By the time TCM unleash themselves onstage with “The Queen is Dead“ there’s hardly room to move. Lashing into their admirable set with a massive version of “Panic“ the room lifts, pints get spilled and bunches of wilting chrysanthemums get waved about in perfect Stephen Patrick style.A notable group of high haired youths indulging in the genre forming indie heritage of The Smiths gather before slick front man Dave, imitating his Morrissey nuances and whimsical delivery. It’s impressive. Considering their youthfulness, they know too much. Throughout the venue serial Smiths fans sing every word back. Johnny Marr worshippers appreciating the seamless trademark guitar work of Gavin. Those twenty years of six string picking practice have paid off Gavin. This level of polished and perfect homage to the Great Marr does not come easily I suspect.TCM blast on with their set spanning “Some Girls“ , “What Difference“, “London“, enhancing the journey through 80’s and albums. Dave improvises his best Manchester accent, delivering “Irish Blood” with passion and Anglo Irish determination. “Regrets I’ve had a few“ strangely precedes the next track “First in the Gang“, dedicating to us, the little charmers. This formidable front man does his Interflora trick casually throwing long stemmed flowers into the adoring crowd. He is almost to chatty to be Morrissey. “Unruly boys who must be taken in hand“ announces “Barbarism“ to the delight of the unruly boys and girls with ambitions to get on the stage. Unmistakeably 80’s riffs open it up, that bass line making room for Morrissey’s vocals to expand into whimsical yips and yelps.A witty dedication to Liverpool fans on “How Soon Is Now“. Clearly even Liverpool fans are human and they need to be loved. “Bigmouth“ follows, by which time the crowd are so mad for it, there’s not a single pint glass to be seen up the front. A brief finish before the sparkling pop rock of “This Charming Man“ whips up the frenzy that gets our vintage ponytail fan onstage singing “There is a Light“ into an empty mic stand. The passionate fan is hilarious if not a bit of a limelight stealer. Security struggle to remove pontytail man, such is the comedy of his mic hugging demonstration. Despite the messing Dave goes onto give us explosive rendition of this romantic yet doomed love song. And just so that you know it TCM “The pleasure – the privilege was mine.“ These Charming Men might be a tribute act, but they’re no pretenders! These Charming Men from Dublin, Ireland were formed in 1995 and to this day continue to charm fans of The Smiths and Morrissey all around the globe with their finely tuned energetic and passionate live shows. They are classed as one of the premier Smiths and Morrissey tribute bands or acts around at the moment. These Charming Men have been performing at the Annual Smiths/Morrissey Convention in Los Angeles since 2001 and were requested to appear in Morrissey’s absence at the Fuji Rock Festival in Japan 2004 to play to an audience of some 35,000 people. These Charming Men are a must for all Smiths and Morrissey fans.